Metallic stearates are the salt of metal with long carbon fatty acid chain known as octadecanoic acid. Generally they are produced by the reaction of steric acid and metal halides, metal sulfate, metal oxide and others. They possess a chemically stable hydrocarbon chain and offers hydrophobic nature. They comprise of several properties such as water repellence, separating property, stabilizing effect, gelling capacity, foam inhibition and lubricating property. Metallic stearates classified into are aluminum, calcium, zinc, and magnesium. It has a wide application in pharmaceuticals, plastics, rubber, cosmetics, coatings, building & construction, and others. The global metallic stearates market is expected to grow at a CAGR of 6.1% during the forecast period of 2017-2027. Rising demand of the PVC and other polymer as process material in several fields is anticipated to drive the growth of metallic stearates market. Further, the favorable government regulations and policies are expected to expand the global metallic stearates market. Further, North America is expected to contribute to the growth of the metallic stearates market over the forecast period. It has several applications in rubber & plastic, cosmetics & pharmaceutical which are expected to showcase significant rise metallic stearates market in the upcoming year. The metallic stearates market has been segmented into calcium stearates, zinc stearate, magnesium stearates, and aluminum stearates. Further, calcium stearates accounted for the largest market share in overall metallic stearates market in 2016. Increasing usage of the metallic stearate in the manufacturing of the plastic & rubber and also growing demand from the pharmaceutical, cosmetics and aerospace is expected to drive the growth of the metallic stearate market during the forecast period. Metal stearate is used as anti-caking agent in building & construction. 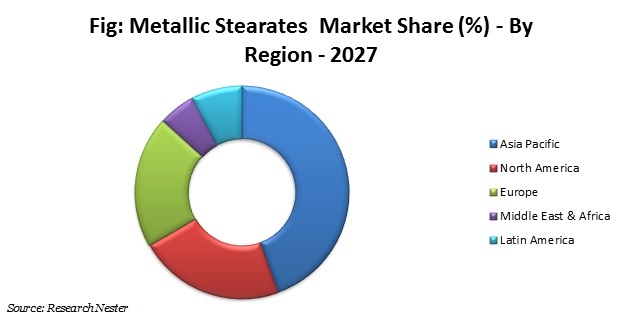 Rapid urbanization and continuous growth of building and construction sector is also envisioned to foster the growth of the metallic stearate market in near future. Moreover, rising awareness related to benefits associated with the product made up of metallic stearate among the population is anticipated to positively impact the growth of the metallic stearate market during the forecast period. Further, government initiatives and policies towards the metallic stearate products are also anticipated to garner growth of the metallic stearate market during the forecast period. However, cost of the metallic stearate product is expected to dampen the growth of the metallic stearate market over the forecast period.